At the BioSB 2017 conference last week on April 4 and 5 2017 in Lunteren, two researchers have been awarded with prizes. 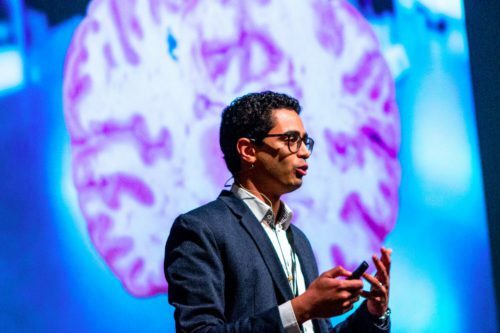 The BioSB Young Investigator Award 2017 was awarded to Ahmed Mahfouz, LUMC. Ahmed received the award at the award ceremony held on April 4, 2017 during the first day of the BioSB 2017 conference. The award ceremony was followed by an honorary lecture by Ahmed Mahfouz, titled: Insights from Mining Transcriptomic Brain Maps. 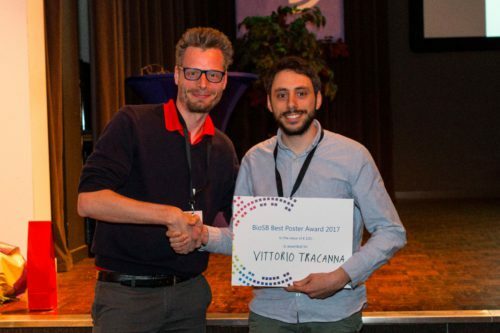 The BioB Poster Award 2017 was awarded to Vittorio Tracanna, Wageningen University & Research. His poster titled: “Harnessing the soil microbiome for improved stress tolerance in crop plant” was chosen as the best poster presented at the conference. Samar Tareen, Maastricht University who presented a poster with the title: “Profiling core processes in adipose tissue during weight loss using time series gene expression”. Both awards are sponsored by the BioSB research school.